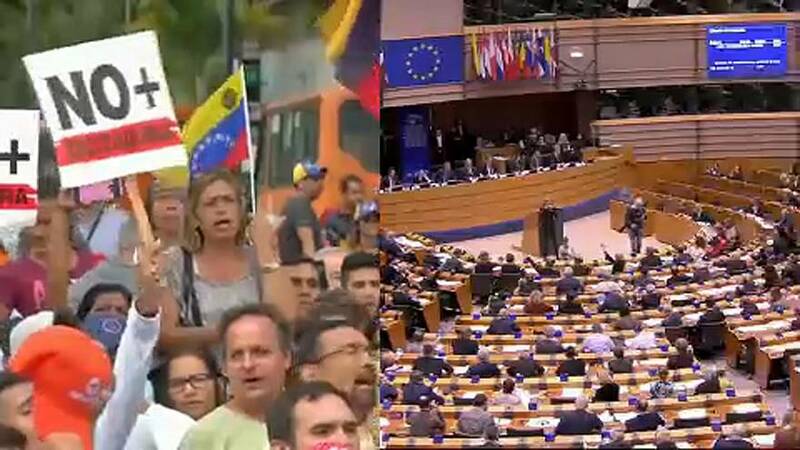 Almost 8,000 kilometres separates Brussels from Caracas, but this week Venezuela was at the heart of European politics. The European Parliament recognised Juan Guaidó as interim President, while EU Foreign Ministers announced the creation of an international contact group with Latin American countries aiming to chart a peaceful end to the political crisis within 90 days. The first meeting comes next week. But let's take a look back at the last 7 days in Europe, with the week in numbers. 113 million is the number of people at risk of poverty or social exclusion in the European Union - hidden among that figure is the number of 32 million people who are in work, yet at risk of poverty. Poverty in the EU is still 4 per cent higher than before the 2008 crisis. 10 is the number of countries meat from a Polish abattoir at the centre of a scandal over slaughtering sick cows has been sold to. Secret filming by broadcaster TVN revealed the poorly animals being killed at a slaughterhouse situated 112km east of Warsaw. The EU said it will send a team of inspectors to Poland on Monday. 2 is the number of weeks a charity rescue boat was stranded in the Mediterranean before being allowed to dock in Sicily following another standoff with EU countries haggling over redistribution. In Brussels you will hear acronyms littering sentences - here are the top ones this week. France, Germany and Britain opened a new channel for non-dollar trade with Iran to circumvent U.S. sanctions. It is hoped the move will save the Iran nuclear deal after Washington pulled out last year and reimposing sanctions on Tehran. Brussels said 'No' to renegotiating the Brexit deal. Theresa May has a new deadline in two weeks time to find 'alternative arrangements' that could satisfy the Houses of Common and the remaining members of the EU. The largest political force in the European parliament, they've been in the spotlight over the membership of Hungary's ruling party Fidesz in their group, especially since MEPs launched a sanctions procedure over concerns on backsliding on democracy. Now the EPP is facing a backlash. "We are all the view that they no longer comply with the values laid down in the European treaties. So we wanted the new authority for European parties to be asked by the parliament essentially to have a look whether the EPP and ACRE (European Conservatives and Reformists) are colluding with the rule of law blacksliding happening from my point of view in Hungary and Poland. The Hungarian ruling party, being member of the EPP has helped the Hungarian government to avoid the activation of Qrticle 7 by the Commission for a long time." Professor Pech said the EP's Article7 resolution did not stop Orbán in Hungary. "Its getting out of control completely now... Article 7 seems to have no political impact at all on the behaviour of the Hungarian government, the CEU has effectively been forced out in December and that was supposed to be one of the red lines not to be crossed." When asked about the political nature of the Hungarian government system the professor had strong words. "I have described the Hungarian system as a soft-fascistic system of government. Some people have said competitive authoritarian system. Possibly that is the most accurate, meaning essentially we have de facto one party state but you have regular elections, so they can pretend that its still a functioning democracy. No, what we have is an autocratic government with elections from time to time, but with elections that can not be won fairly, because there are no fair elections. " The professor thinks Manfred Weber's election to European Commission president will be finally vetoed by some member states because of his record of helping Hungary's Orbán to escape EU sanctions. While the issue of migration continues to divide Europe, Euronews travelled to Calais to see what life is like for a group of Afghan and Iranian asylum seekers and those who try to offer a little solace. Watch our report in State of the Union.